tracks and one of each road course,street course and oval),but 3 rounds with the "weaker"
tricky to handle on gravel,giving a great challenge to driver. 2 rounds in early/mid-december 2012,and continuing in 2013 - 3 rounds each in january and february. * Layout of round 2 (Kyoto GP 100) available here! ** Layout of round 6 (Aston Club Cross) available here! After round 6,no new sign-ups will be accepted. In last 2 rounds only drivers received at least one point in standings will be allowed to participate! * In rounds 7 and 8 will be used hotlap qualifying,this means there will be no specific lenght of qualification,every driver will run alone and have outlap and 2 hotlaps. Qualifying oreder will be determined by points standings - the highest ranked driver will start his laps last,lowest - first. Race start will be approx. 10 minutes after qualifying. * In rounds 1-7 only best 24 qualifyers will be allowed to start (in 2 tracks due to grid limits,in others - to equal round conditions),but in last round full 32 car grid will be allowed to start. * If there is no max allowed grid,drivers championship top 10 drivers will be allowed to start from pits (12 seconds after initial race start) if came late and missed qualification. As this is the second season for this league in international level and we are not accepted from higher instances to be good enough for own forum subsection,we will not make a mile long rule book that noone will read completely anyway,we will rely on common sence of competitors to behave and follow the basic Rules of Clean Racing. There will not be an admin in server who will specifically observe drivers behaviour during the race. If any incidents reported/protested,we will take individual approach to each of them to decide best resolution or punishment if needed. Blue flag - you may not deny/block a passing manouvre of laping car and try a repass right after it. In qualification it means - stay off racing line and don't disturb drivers on hotlap. Shortcuts - 2 wheels on track at all times,in controversial KY GT case we will use LFSW hotlap system rules,where also the paved green area counts as legal surface. Pit exit - allthough there will be no mandatory pitstop in this league,pit exit lines will have to be respected! Everyone caught crossing pit exit lines with more than 2 wheels will receive 10 seconds penalty added to finish result. In last round,which is held in KY Oval also pit entry must be respected - driver have to enter pits on apron before turn 3. Chatting - it's not completely outruled,but still drivers are expected to concentrate on racing. In case of too much chatting while ignoring messages asking to cease chatting,a penalty may be given. In case of any abusive/offensive language a penalty will be given! Lags - if there are any connection issues,driver will be asked to improve (close internet using programs). If driver will be considered as dangerous due to unstable connection,he will not be allowed to participate. Hacks/cheats - if used,you will not race with us. Ever. As simple as that. WARNING - any minor infraction that needs to be noted without penalty. Warned driver might receive bigger penalty for other infractions. 10s added to finish time - minor infractions like pit exit line violation,too much chatting. 30s added to finish time (1 lap penalty in last 2 rounds) - medium infractions like causing avoidable incident[s] without serious consequences. 60s added to finish time (2 laps penalty in last 2 rounds) - medium infractions like causing avoidable incident[s] with consequences to other drivers (like damage,multiple position loss). Disqualification for 1 or more rounds - heavy infractions,multiple incidents,unsportsmanlike behaviour. After serving disqualification,driver will automatically carry a "warning" for the rest of season. Series exclusion (including ban for any other events run under Race Green Events control) - serious infractions like intentional/revenge wrecking,event sabotage and any other malicious act. In case there are any changes to sign-up details,please quote your edited post in a new one with a note about changes! We will not use any numbers,skin requirements or official names for this season. 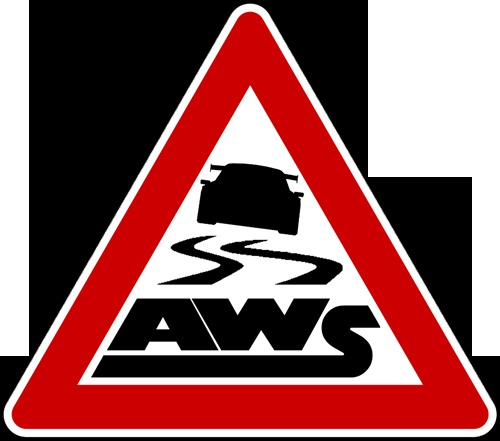 But still feel free to use AWS logos on skins if you wish! 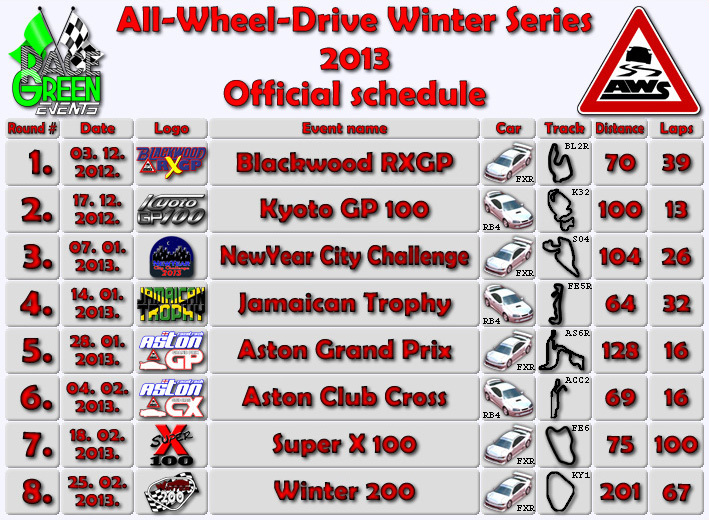 Sign-up tracking and all the standings can be found in AWS 2013 spreadsheet. Signed-up drivers will receive server information and password at least 24h before round start (usually sunday morning european time) via PM on this forum! Server will be online without password until then. Series will be run using the latest stable version of LFS. Last edited by Stig209, Tue, 27 Nov 2012 13:24 . Last edited by drunk85, Sun, 4 Nov 2012 09:02 . Last edited by Muc, Mon, 3 Dec 2012 18:54 . Quote from Eclipsed : In case there are any changes to sign-up details,please quote your edited post in a new one with a note about changes! Would love to participate, but at 2 PM EST I can't make it on time. Would I be able to join the server at around 19:30 and make the start of the race? Quote from Cornys : Would love to participate, but at 2 PM EST I can't make it on time. Would I be able to join the server at around 19:30 and make the start of the race? Quote from Eclipsed : * In rounds 1-7 only best 24 qualifyers will be allowed to start (in 2 tracks due to grid limits,in others - to equal round conditions),but in last round full 32 car grid will be allowed to start. That's all,what can I say to you - there are no wildcard starting spots in AWS,so you have to post a lap in qualifying in 1st round,finish in top10,in next round you can start from pits,finish in position to keep top10 in standings and so on! Nothing impossible! Last edited by Victor, Thu, 24 Nov 2016 19:42 . ...and the server is updated to latest patch!